On 25 March, Peter Hendriks took up his position in A+G Transporten's planning division. Besides its branch in Nettetal, Germany, this company can also be found in Venlo, the Netherlands. "The company is mainly focused on international transport. With my background, I want to expand its activities. I want to include national fruit and vegetable, as well as flower and plant transportation," says the transporter. 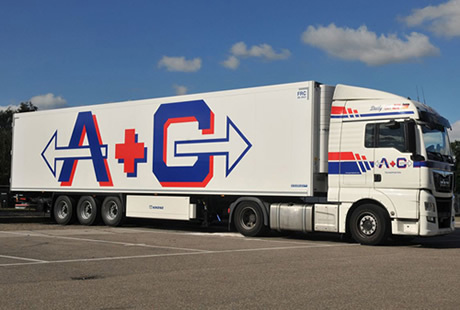 A+G Transporten has no fewer than 120 vehicles on the road. Of these, 75 are refrigerated trucks. "The company has been active for 25 years already. Besides fruit, vegetables, flowers, and plants, they also transport general cargo and frozen goods. Using my expertise, I want to add domestic fresh transport to this. I want to find combinations which will fit into A+G Transporten's network", explains Peter. "I used to be active mostly in transport from Westland to Venlo. Now, we will combine far more with transportation routes from Westland to Germany, Switzerland, Austria, and Belgium. For example, we have daily vehicles heading to the Belgian and Dutch trade centers. The company's size makes us very flexible," he goes on to say. "We have been at this for a few weeks now, and I am not dissatisfied. We have eight trucks going to Westland very day. We hope to expand these volumes in the coming weeks. People from the sector who have logistical questions about national and international fruit, vegetable, flower, and plant transportation are welcome to contact me," Pieter concludes.